Johanna Day as Margie, Francesca Choy-Kee as Kate and Andrew Long as Mike in Arena Stage at the Mead Center for American Theater’s production of Good People. Photo credit: Margot Schulman. A woman struggling as she slides further into poverty meets a former boyfriend whose life has taken the opposite trajectory, and the powder keg of class, gender and race is ignited. If David Lindsay-Abaire’s play Good People were a 1940s film, Barbara Stanwyck would star, martyring herself for her man and her child, and many handkerchiefs would be wrung wet by the end. Corset her up and we’ve got Dickens or Hardy. It’s not intentionally a “weepie,” however, it’s the playwright’s well-meaning attempt to honor the working class neighborhood of his childhood: South Boston. But he can’t escape the conventions other writers have fallen into time again when trying to make sense of the cruelty of chance and circumstance, the razor’s edge that separates rich and poor. Does that matter? After all, it’s well-awarded, and the most produced play of American theater’s 2012-13 season. The essential story is told repeatedly because, sadly, it’s still relevant. 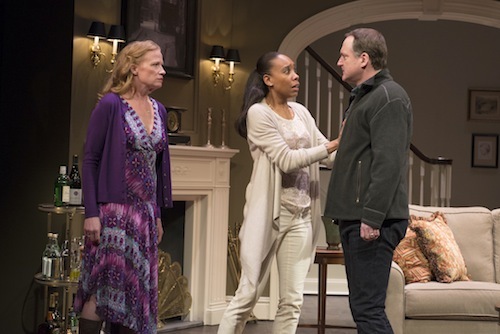 The success of Arena Stage’s production of Good People hinges on its lead actor, Johanna Day, whose bravura performance as Margie is electrifying, and true. We all know someone who ends badly through a combination of coincidence, choice, and misplaced pride. Lindsay-Abaire chooses to end with a hope-delivering deus ex machina that certainly resonated with the audience the night I saw it – the raucous laughter and standing ovation proves that everyone wants to believe there’s always a way through. No matter how bad things get, a good person always gets bailed out. We can laugh at life’s punches, right? I couldn’t join in, and I can’t explain why without spoiling a major plot point. Doesn’t that prove the play’s successful, if it affects me so much I can’t be objective? When theater actually makes you angry in a complex way? Given the play’s theme, the economic question about whether it adds anything to the debate that’s worth its ticket expense seems even more valid. Is there anything here you couldn’t get from watching one of those old weepies (or Good Will Hunting, as a friend pointed out afterwards), or reading Hardy? Essentially, this is an “actor’s play,” and the flawless direction by Shaw Festival artistic director Jackie Maxwell guides the ensemble sharply. There are minefields of uncomfortable comedy here, and everyone is committed to the attack. Day’s performance as Margie is a master-class of laser-like intention, and the predictable plot twists are only made palatable by being sympathetic to her journey. She’s matched by Amy McWilliams’ honest rendering as Margie’s acerbic friend Jean, and Francesca Choy-Kee makes Margie’s old boyfriend’s young wife Kate far more complex than just a trophy. The men aren’t as firmly grounded, especially with those notoriously difficult accents, and Andrew Long as Margie’s old flame Mike doesn’t match Day’s intensity. Perhaps that’s intentional, but it felt disjointed. This is a production whose power comes from its female performances, which does seem a fitting tribute to those working class matriarchs without whom no one would survive. But, those plot twists. There’s a rather distasteful Victorian heart at the center of this play that deals with women’s sacrifices for men. A play about the grinding, plodding, terrible horror of slowly losing your livelihood would’ve carried far more weight with me, and though Lindsay-Abaire has Margie deliver one powerful monologue about it, for the most part he chooses to go elsewhere. At the end of the night, it’s simply not the play about class in America that I wanted to see, the one that might invigorate people to change the broken system. As it’s so widely produced now, I hope I’m wrong, and that everyone who laughed so uproariously went out that night inspired to do something for the Margie they know. Good People performs now through March 10, 2013 at Arena Stage at the Mead Center for American Theater, located at 1101 6th Street SW, Washington DC 20024. Closest Metro stop: Waterfront (Green line). Tickets range from $40-85. For more information call 202.488.3300.